I love technology, but sometimes it doesn’t like me. And I guess if I was my old organized, super efficient self than this would not be a problem. But sometime after giving birth I lost all my ability to organize, think rationally and sometimes my common sense. Usually when I am developing recipes I have my laptop in the kitchen with me, and I type it out as I go. My instructions are usually ultra-abbreviated, but that is how I was taught to write recipes in a busy professional kitchen. I translate them into actual sentences later for the general public. For some reason, on the day I was making these lamb chops I did not have my laptop, so I scribbled out the basic recipe on a shopping list pad. And then I left the piece of paper on the counter, where cats, kids and old ladies all had the chance to throw my recipe away! See what I mean about common sense. . .
Luckily I found the paper, and though I still did not have my laptop, I was smart enough to make it a note in my iphone. And I threw away that scrap of paper. Life went on, more recipes were developed and I forgot all about my poor little lamb chops. While editing a ridiculous amount of photographs I came upon my lamb chops! Yay, I thought, let me get these up on the blog right away! And then I could not find the recipe. I frantically looked for that piece of paper everywhere! No recipe. Was it in my “Recipes being Tested” folder? No. Was it in my Evernote recipe file? No. Was it in my Microsoft word recipe file? No. Sigh. . . I began to think I might have to recreate the recipe again. Then one day while looking through the notes on my phone, low and behold I found my recipe! Lesson learned, do not start a new recipe without my laptop handy or at least a dedicated recipe notebook! 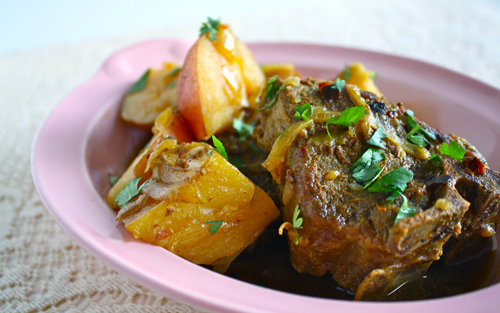 So without further ado, here is the delicious Braised Curry Lamb Chops and Potatoes! Place the lamb chops onto a large plate. In a small bowl mix 2 tablespoons of the curry powder and 1 teaspoon of olive oil. Spread the curry paste over the entire surface of the lamb chops. Let the chops marinate at least one hour to overnight. In a large skillet, heat the remaining olive oil over medium high heat. Brown the lamb chops well on both sides, then remove to a plate. Add the sliced onion, remaining curry powder, sea salt and cumin seeds. Cook, stirring occasionally, for 4-5 minutes, or until the onion is softened and the spices are fragrant. Pour in the broth, and scrape the bottom of the pan to remove any bit crusted on. Add the lamb chops and potatoes, bring to a boil, then cover and reduce to a simmer. Braise the lamb for 20-25 minutes, or until the meat is tender and the potatoes are cooked through. That oxtail stew sounds dimple and delicious! Enjoy those grandkids! Thanks, I’m a retiree living alone in 2 bedroom ground floor apt in Toronto. I’m cooking the lamb outside on the side burner of the bbq so I won’t have to smell curry inside for the next 3 days. I’m a CBC (canadian born chinese). I will be cooking dinner for my grandkids, daughter and son in law tomorrow. I do that once a week, get to share a meal with the kiddies, grandson will be 6 in June and granddaughter 3 next month. I will be making oxtail stew. bring oxtails to boil, dump the water, clean the pot, oxtails back into pot and pour large bottle of original receipe V8 juice and half litre apple juice, pour apple juice into V8 bottle and shake well to get all of the v8 juice out. Use med. heat and bring to boil, add potatoes, carrots, cabbage, 3 to 4 hours. serve over rice. great meal for winter. My late mother’s receipe.